Situated in the North of the Annapurna Himal and bordering Tibet (China), the Mustang Region used to be called Mustang kingdom. Consequently, it drew much attention as prohibited Kingdom. Mustang is a most remote area, it is a geographic extension of the Tibetan plateau, a windswept land of mountains preserving the last authentic remains of Tibetan culture. This area was completely isolated from the rest of the world and only opened to trekking groups in 1991. The barley, potatoes, and buckwheat are grown here are the staple diet of the villages through which our trek passes to reach the ancient walled fortress city of Lo Manthang. From here the border of Tibet is just a stone’s throw away. From Lo Manthang we can either return along from the same trail or head back to Jomsom by way of the sacred pilgrimage site of Muktinath. Upper Mustang is the one of the challenging and adventurous motorbiking in Nepal. Today after breakfast we will go for full day sightseeing tour around Kathmandu valley, very ancient and essentially enlisted in UNESCO World Heritage sites. Till then we prepare Motor bike trip permit and Special Permit to upper mustang. Gear up as we have our first motorbike day where we drive after breakfast alongside the Trisuli River with views of green valley’s situated in front of the nearing mountains. We drive up the many curved roads to Pokhara. A real Himalayan adventure day awaits us as we drive up about 85km to Beni along side the Kaligandaki River with emerging scenic views of Annapurna. Beni is on the Annapurna trekking routes. We now are in the mountains and our trail rises and descents, crossing small Nepali mountain villages where in Tatopani a well deserved natural hot spring awaits us en where we will enjoy the nature of the mountain range. 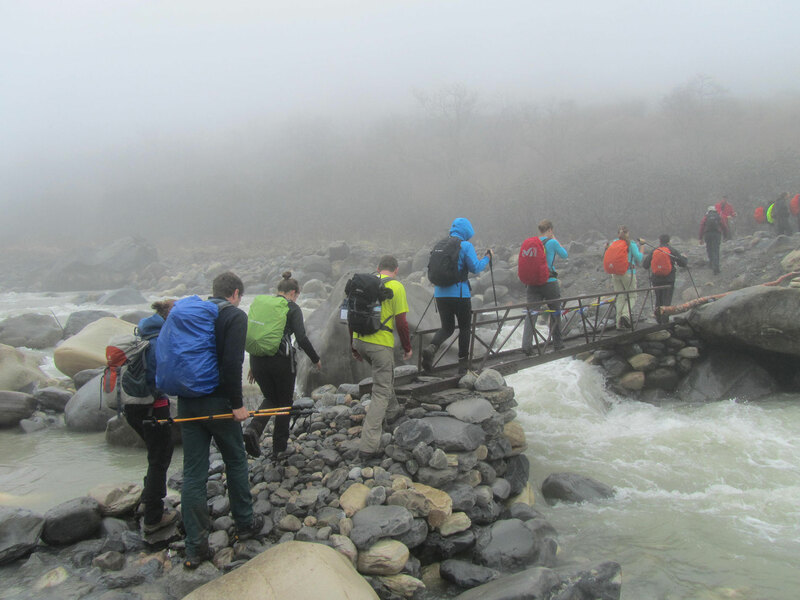 We will leave early in the morning steep uphill from Tatopani to Kagbeni via Dhana, Ruptse, Ghasa and Jomsom. The road follows the Kali Gandaki valley. The river cuts a channel between the peaks of Annapurna I and Dhaulagiri and qualifies the Kali Gandaki valley for the world’s deepest gorge. Kagbeni is the starting point of the Upper Mustang. The spectacular peaks of Nilgiri, Dhaulagiri, Tukuche Peak and Dhampus tower above the sparse brown landscape as you drive on gently undulating trails until you reach Kagbeni, an interesting and typical Tibetan village. From Kagbeni we enter the region of Upper Mustang, which until very recently was restricted to travelers. After a short steep climb, we reach the beautiful village of Chele. Chele La Pass at 3,630m is our first checkpoint, from here we drive until to the Yamda La ( 3850m) through syanboche, during the day we will passes a small tea houseas, chortens and village with a Tibetans styles house. Ghami is the small village sheltered by overhanging cliffs and next to a clear stream surrounded by barren large fields. The afternoon is in perhaps the driest part of Mustang and the views of countryside are magnificent with the rugged mountains in the east and west. Today, we head out to our final destination towards the capital of Mustang where the king of the mustang still resides. Lomanthang the walled city. There are Four major temples within the city wall. Usually, The approach into the temples could be successful after a bit negotiation. Today we leave you here for explore the charming city of Lo – Manthang, the city contains about 150 houses, as well as residences for its many lamas. There are four major temples within the city and one of these, Champa Lhakang, contains a huge clay statue of Buddha as well as elaborates mandalas painted on the walls. The king’s palace is an imposing building in the center of the city and is occupied by the current King and Queen. Although his duties are largely ceremonial, the King is respected by the people. It is also possible to hire horses and get different experience with horse riding. Today we will explore Lo Manthang and Chosyar valley. We will visit all the temples of the area and other villages. Continue to the villages of Shija and Guruk where you will find the only cave dwellers of Nepal. We will drive to Tibet border observing on the way villages and cultures. After breakfast, we bike downhill through river via Ghami, Syanbochen, Charang to Chusang. Today after breakfast we bike back downhill, which will be very pleasurable on the jeep tracks trails! Today we have to start early as the wind gets strong after 11 am making motorcycling more challenging. Chill out on this section of the trail and enjoy the views of many different mountain ranges up to Beni. Today we bike jeep track to Bandipur. Bandipur is a living museum of Newari culture, a beautifully preserved village crowning a lofty ridge above the highway stop of Dumre. After breakfast you are free in leisure until the time of departure. And transfer you to the international air port for your onward destination. One guide for whole tours including his motorbike. Op 6 nov 2016 vertrok ik via Dubai naar Kathmandu om daar mijn mede reizigers te ontmoeten waarmee ik een rondreis ofroad trip ging maken in Nepal met de Himalayan Leaders. Ik werd ontvangen op het vliegveld in Katmandu en naar prima accomodatie gebracht waar ik drie van mijn reismaten ontmoet. Na twee nachtjes slapen en de volgende dag site seeing in de stad kwamen ook onze twee laatste reizigers aan uit Limburg. De motoren 220 cc Bajlal stonden klaar en we zijn de stad uitgereden voor onze trektocht. Een gids tourleider was mee achterop bij onze machanicien. Met acht man en zeven motoren vertrokken we voor onze rondrit waarna we na 21 dagen weer aankwamen in Katmandu. We hebben een geweldige reis gehad. Alles werd geregeld tiptop door onze reisleider Hem en Rajesh. Een avontuurlijke reis als deze vraagt wel een beetje motorervaring en wij waren het er over eens dat we soms aan de max van ons kunnen zaten zeker qua ofroad gebeuren. Tenslotte praten we over zes ervaren motorrijders van om de 60 jaar. Verbaasd waren we over de kwaliteit van de motoren die zonder slag of stoot bij de bestemming aankwamen. Valpartijen , rivier doorwadingen en behoorlijk steenslag en stoot te hebben doorstaan. 1 lekke band telden we aan het eind van de rit. Onderweg had Rajesh uiteraard wel het nodige onderhoud gedaan. Accomodatie onderweg was naar de Nepali maatstaf goed net als het eten.. Wel dient opgemerkt dat we wel veel in aardbeving schade gebied zaten met alle gevolgen van dien. Kortom en geweldige 23 daagse reis mede namens mijn medereizigers en dankzij de Himalayan Leaders en Hem en Rajesh.